At last, dawn has come. Since the l’m currently in far-off lands visiting a friend, I’m using the small amount of downtime that I have to complete a project that I’ve been tweaking off and on for the past month. So instead of highlighting a place worth visiting in the “real” world, I’m going to transport you to a strange, vibrant place, birthed from pure imagination. What I’m about to show you is the result of many hours of patience and focus, and I’d love to hear what you think about it in the comments. Even if you despise it! Today I’m releasing a complete refresh of Crescent Island, and I’m calling it Crescent Dawn. I think this one will be more popular than the previous wallpaper set (called MorningTide), because it’s easier on the eyes, it’s more elegant, and has a more relaxing and dynamic color palette. I’ve even added some surprises. You remember the old Crescent Island, don’t you? I first revisited Crescent Island in 2008 and released a new version called Crescent Island Nightfall in the summer of that year. While being an improvement over the original (mostly because I understood lighting much better than I had when I’d created it six years previously), it still lacked a certain elegance. The atmosphere still wasn’t quite there. Fast forward three years to a couple months ago when I began toying with the scene again. That’s when it hit me. 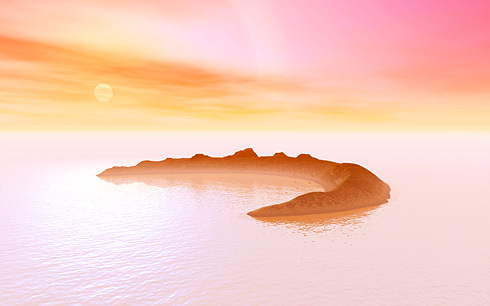 I realized that Crescent Island would be beautiful bathed in the warm, womb-like colors of the morning. So, after hours of experimentation and tweaking, I’m very pleased to present Crescent Dawn to you now. It’s the result of uncounted hours of fine-tuning and revision. (Somewhere between 10 and 10 billion hours.) And, per the suggestion of a friend, I even added some wildlife to give the island a more lively flare. I hope you find it refreshing. I’m especially pleased with how the sky came out.